What is structure and why is it important when fishing? An angler can significantly improve the potential for a successful during an outing is with their ability to recognize the presence of structure and how to use it to their advantage. This knowledge along with several other scouting skill sets can give both the novice and experienced angler that competitive edge. Structure can be defined as anything having an unusual characteristic found either under water or protruding vertically. Many structures are created by nature or placed there to either support another structure or another purpose. Regardless of the types of structures, they can also be found at various locations and water depths. Either way, structure is beneficial for both anglers and many saltwater species. Vertical structure could be pilings, bulkheads, tree stumps or jetties that extend above the surface. Horizontal structures are submerged and may include depressions, holes, drop-offs, ledges, rocks or sunken logs. The most common horizontal structure are small holes or depressions and the change where sand bottom meets a grass flat. Structure provides safety and food source for many species. The fish’s ability to move around this formation provides their ability to avoid another predator. Also, many small bait fish and crustaceans remain close to structure adding to the larger species food source. When fishing a vertical structure, the angler should focus on the leeward side. Fish typically remain in the calm leeward side waiting for a bait fish or other species pass by. When fishing a horizontal structure such as a depression or grass flat, let your bait pass as close as possible, changing speeds and action of the retrieve. When fishing structures, anglers should mimic the action of a bait fish or crustacean. It must be a natural retrieve. Bait or lure presentation here is extremely important as not to spook or chase the fish out of that zone. The bait or lure should be retrieved slowly both in the current and static areas. Then repeat. Proficient anglers have the ability to use various retrieval or twitching actions that cause either anger, fear or even a keen interest that increase the bite. But it is imperative that the action must be natural and lifelike. Some structure is easily located but others are not. Vertical structures are obvious. But horizontal must be discovered. One way to locate a bottom structures is to take either a bank sinker or a lead jig head with the hook removed attached to a break-away light test leader and cast out in various locations. Feel and resistance during the retrieve can reveal uneven and structure components. Ability to recognize and use structure is the easiest way for an anglers to improve their catch rate. And although it’s an important part of finding fish, its only one tool in the angler’s catch box. The ability to recognize structure and use it to catch fish can be a game changer. Why did I start the “Walkingangler” website? 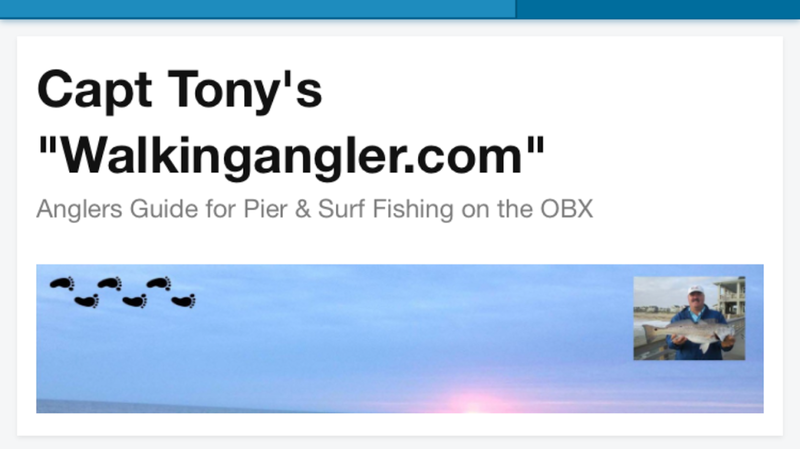 This website was started ten years ago in July 2008 to provide a local resource for Outer Banks boat-less anglers who like to fish on the surf, sounds, jetties, piers and local bridges. The site was designed as a self-help guide. There are lists and drop down menus throughout the site indicating some of the best places to fish, what gear works best and many subtle techniques to help give the angler a little better advantage. The idea for this website originated several years ago while I was browsing the fishing section at a local big box store. Walking down the aisle, I overheard an aggressive and unfortunately very inexperienced salesperson attempting to sell this new vacation/visitor hundreds of dollars of gear that would never work in our area. I could sense that this first-time visitor was tired from their travels and wanted to just look around this department and move on. As any excited vacationer, they just wanted to try some surf fishing and maybe catch some crabs. What this visitor left the store with was hundreds of dollars of worthless gear that they would never be able to use in this region. And if they did find a way to use it, the frustration of failure would have turned them off to fishing our area for many years. I felt helpless and then a little frustrated. That’s when I found myself committed to do something. This commitment lead me to begin searching for any local Outer Banks fishing resources. I found many local websites which included minimal support but none that contained the basic information a new angler needed. What the Outer Banks needed was a one-step local resource that contained specific species information, locations to fish, tried and proven techniques and hints and special tips that are easy to follow and understand. What resulted was this website where visitors and experienced anglers can find basic fishing information. And then use this information data base to help either the novice or experienced find new locations or proven techniques or just hone their skills to improve their catch success. This website is the one-stop shop resource for boat-less fishing on the Outer Banks. The success of this website can only be measured by the success of its users. My intent is to help visitors and locals alike to begin their journey. Like many resources, the only constant is change. And so it is with this website, it always under change and updating. Ten years and counting and hopefully many more. Thank for visiting using my website. Check back frequently for new and revised local fishing information. If there is something missing, email me and I will try to add it. RALEIGH, N.C. (June 20, 2018) — On July 4, the N.C. Wildlife Resources Commission invites anglers and would-be anglers of all ages to go fishing — for free. From 12 a.m. until 11:59 p.m., everyone in North Carolina — resident and non-residents alike — can fish in any public body of water, including coastal waters, without purchasing a fishing license or additional trout fishing privilege. Although no fishing license is required, all other fishing regulations apply, such as length and daily possession limits, as well as bait and tackle restrictions. To give anglers a better chance of catching fish, the Commission stocks a variety of fish in waters across the state — including trout and channel catfish. The agency also provides access to fishing sites across the state, including public fishing areas and boating access areas. The interactive fishing and boatingmaps on the Commission’s website list more than 500 fishing and boating areas, many of which are free, that are open to the public. Started in 1994, free fishing day is an annual tradition, sponsored by the Commission and authorized by the N.C. General Assembly. It always falls on July 4. 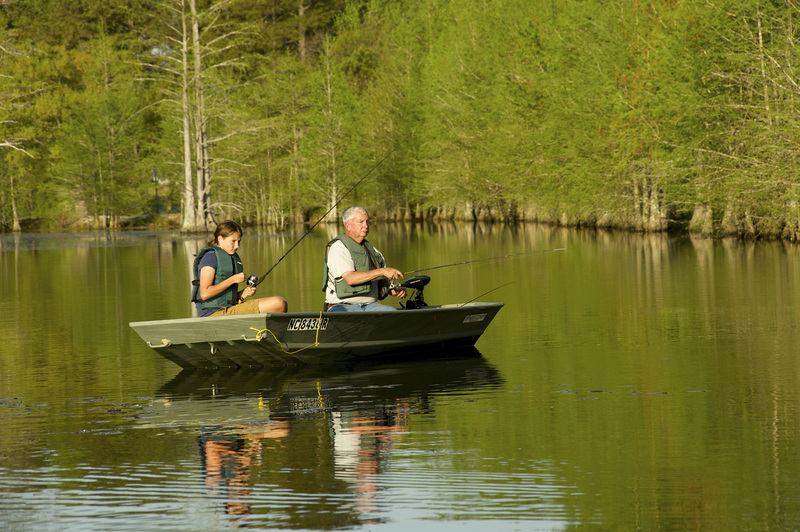 On all other days of the year, a fishing license is not required for anglers 15 years and younger, but anyone age 16 and older must have a fishing license to fish in any public water in North Carolina, including coastal waters. Visit a local Wildlife Service Agent. For more information on fishing in public, inland waters, visit their Fishing page. There is no better opportunity to introduce a “Kid to Fishing” and maybe yourself. Enjoy this free day compliments of the North Carolina Wildlife Commission. How accurate is a local fishing report and how can it be used to help the angler catch more fish? A fishing report is only as good as the information it contains. Reliability is imperative. And any Information that is skewed or exaggerated or is plain false can only lead to angler frustration and mistrust when searching for future data. 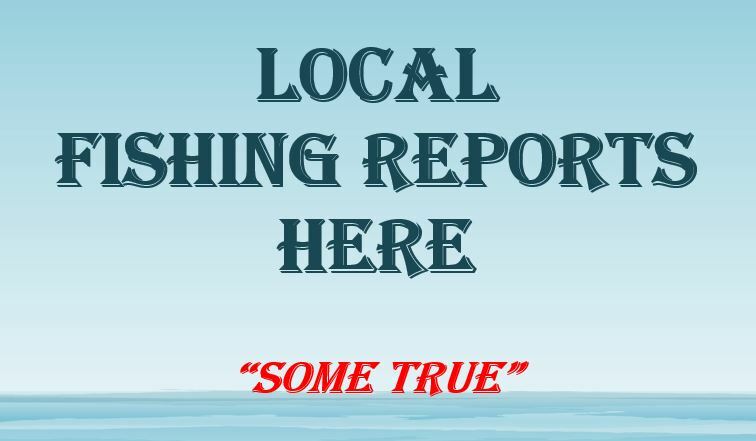 So a fishing report must be accurate, reliable and user friendly to be of any value to the angling community. A detailed fishing report is basically the cornerstone of any fishing trip. Most tackle shops and marinas provide periodic updates on the current catches. These reports are typically posted or broadcasted through selected media where they are easily accessed. But the basic fishing report should only be the beginning of a long list of other data to ensure the trip goes as planned. Most fishing reports will give the species caught, possibly the type of bait used and general location such as “caught on the bridge”. What is not included is the times, tides, current or water movement, water temperatures, specific lure or hook size along with many other important factors. This information is readily available from the tackle shop and marina personal. But it is important to ask them and describe your fishing goal and objectives so they can provide the proper guidance. Many anglers depend on second or third party reporting such as radio or news print. While this is accurate, it is sometimes incomplete. When listening or reading these reports, it is imperative to question what other circumstances existed during the catches. Only then will the angler benefit from not only the reports but the increased success. So when an angler is planning their next outing, successful anglers do their homework researching not only the “catch” reports but the other factors that went into catching that fish as well. The planning done prior to heading out will pay benefits many times over. Which Fish bait is the best to use when fishing in saltwater? This question is probably the second most asked question after where should I fish today. So what’s the answer? It depends. Just like the number of species, there are dozens of types of bait to use. Each type of bait attracts certain species. Some baits are good for all species but then there particular baits that work on just certain species. Today we are only going to discuss three basic types of baits: Live bait, fresh or natural bait and artificial or synthetic baits. Each type of bait has its place in your arsenal. Live baits – these baits are the most productive. A saltwater species is likely to choose a live bait over any other. Examples of live baits are shrimp, sand fleas, small bait fish, clams, and many types of worms. Most fish species will chase and consume another species regardless whether it’s their own species or different one. A living bait creates vibration, special sound and a scent that attracts the predator. This feeding could be as a result of aggressiveness, protection, or simple self-sustaining. Live baits are typically the most productive and should be the preferred bait of choice. Natural or fresh baits also work very well. Examples of these baits are bagged shrimp, squid, and cut mullet or other species. Some natural baits will be found frozen in individual packages. These baits work well because they appear an easy food source. Occasionally, presentation can increase the attractiveness of the baits. The one exception is when the baits are frozen. Once frozen, the baits have a tendency to lose much of its scent. Artificial baits will also catch fish. These baits include synthetic materials such as “Fish Bites”, soft plastic worms or imitation or fake fish-like lures. These baits and lures are also very productive in most settings. The advantage of artificial baits is their longevity and staying power. When using artificial soft plastics, always select the pre-scented types. Most saltwater species have sharp teeth or a mechanism to separate the baits from the hooks, and using a tough soft plastic or synthetic material sometimes makes it difficult for the fish to steal it before being hooked. So we go back to the question of “which bait works best”? Well, all of them under different conditions. And as the angler, your ability to find the correct bait when targeting a certain species can increase your success rate. A good rule to follow is to always check with the local tackle shop professionals before heading out. They can help determine which will provide you with the best opportunity for success. Also, don’t be afraid to change to a fresher piece of bait frequently or even a different bait all together. Final tip – there is an old saying for maximum success, always try to use a bait that will “Match the Hatch”. We left hard baits for another article – so check back for this at a later date. This proclamation supersedes proclamation FF-1-2018, dated January 3, 2018. This proclamation opens the recreational spotted seatrout fishery as outlined in the N.C. Spotted Seatrout Fishery Management Plan Supplement A, following a closure implemented due to a cold stun event in January 2018. It is unlawful to possess spotted seatrout (speckled trout) less than 14 inches total length. It is unlawful to possess more than four (4) spotted seatrout (speckled trout) per person per day taken by hook and line or for recreational purposes. A. This proclamation is issued under the authority of North Carolina G.S. 113-170.4; 113-170.5; 113-182; 113-221.1; 143B-289.52 and North Carolina Marine Fisheries Commission Rules 15A NCAC 03H .0103, 03M .0522. B. It is unlawful to violate the provisions of any proclamation issued by the Fisheries Director under his delegated authority pursuant to N.C. Marine Fisheries Commission Rule 15A NCAC 03H .0103. C. All undersized or over the daily harvest limit spotted seatrout shall be immediately returned to the waters where taken, regardless of the condition of the fish. D. The intent of this proclamation is to manage the Spotted Seatrout fishery in accordance with the Supplement A to the N.C. Spotted Seatrout Fishery Management Plan. E. Contact the N.C. Division of Marine Fisheries, P.O. Box 769, Morehead City, NC 28557 252-726-7021 or 800-682-2632 for more information or visit the division website at http://www.ncmarinefisheries.net. F. In accordance with N.C.G.S. 113-221.1(c) all persons who may be affected by proclamations issued by the Fisheries Director are under a duty to keep themselves informed of current proclamations. G. This proclamation supersedes proclamation FF-1-2018, dated January 3, 2018. This proclamation opens the recreational spotted seatrout fishery as outlined in the N.C. Spotted Seatrout Fishery Management Plan Supplement A, following a closure implemented due to a cold stun event in January 2018. An angler who is always prepared has a significant advantage over those who are not. We have talked many times about using any available data to the advantage of the angler. And if we do our research properly, and there is plenty out there, we can increase our chances of success. A prepared angler is one who will be able to anticipate, recognize and then control the given conditions they find during their fishing trip. And the only way to do this is to do their “homework” or in other words, develop a strategy. Developing a successful strategy involves many steps and components. And one of the most important steps of this strategy should be to know your prey and their comfort zone or their safe environment. And how any outside influences can affect them. Most fish species don’t achieve longevity or size by being fooled easily. Their environment is one of familiarity. And any unusual or unnatural condition raises a concern for their safety. All natural underwater environments contain certain influences, sounds and vibrations. These conditions and affects can originate from structure, feeding activities, travel of other aquatic and non-aquatic sources or just a natural flow of above ground vibrations from greenspaces or surface encumbrances. So the anglers first step of preparation is to know how each of the discussed conditions affect the species you’re targeting in their own underwater environment. Anglers should also know feeding patterns, temperature preferences, travel highways and how tidal changes affect your target. One component not typically discussed but is always out there and should be considered: How will your presence affect your prey when fishing from the shore or boat? There is a big difference between friendly noise and strange unnatural noise. A good knowledge how this affects your target can greatly improve your chances. Another important consideration – if the fish hear or sense you are near, can they also see you? Most anglers just grab a rod and bait bucket and head to the nearest bridge or pier and expect a great catch. Sometimes this works but others times especially in aggressively fished areas where your prey is wise to anything unusual, preparation is the key. Tackle shops and our local pier staff are a great resource. But the best strategy is to study your prey and develop a comprehensive strategy on your own. It will definitely help you understand your prey and improve your catches. The best advice a good friend gave me some time ago and has helped me catch more fish is, “More fish are caught the night before”. 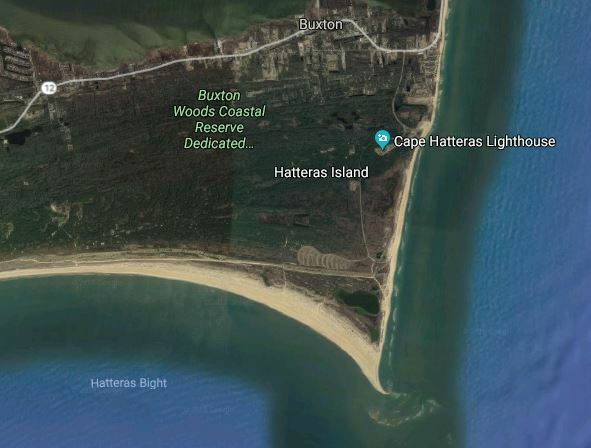 Per a recent announcement from the Cape Hatteras National Seashore, beginning early Saturday morning, May 19, a temporary wildlife protection area will be installed near the tip of Cape Point to protect nesting shorebirds. When the protection area is installed, Off Road Vehicles (ORV) and pedestrians will be able to travel approximately 0.70 miles south of Ramp 44. It will be the first time that the Cape Point area has had an ORV restriction in the past 660 days. Cape Hatteras National Seashore stated that they understand that the tip of Cape Point is a very important area for visitors in the announcement. “While it is not possible to provide an exact date for when ORV access all the way to Cape Point will be restored, be assured that Seashore staff will actively monitor the nesting shorebirds daily in order to ensure appropriate protection buffers are maintained and to be able to reopen the area as soon as possible,” read the statement. Fish are biting on the northern beaches. For the past several weeks, it’s been all southern areas including Hatteras Island and the Point. 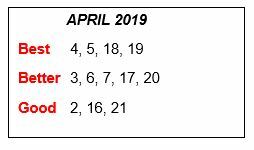 But over the last week or so, most of our spring species have moved into the northern waters. The surf anglers have seen occasional catches of speckled sea trout, sea mullet, blues and a few puppy drum. Fresh shrimp and cut bait on two hook bottom rigs, fishing close in just in the sloughs and adjacent to the piers appear to be the best bets. Also, any moving lure such as a lead head with variety of soft body swim or finesse bait attracts those hungry fish. 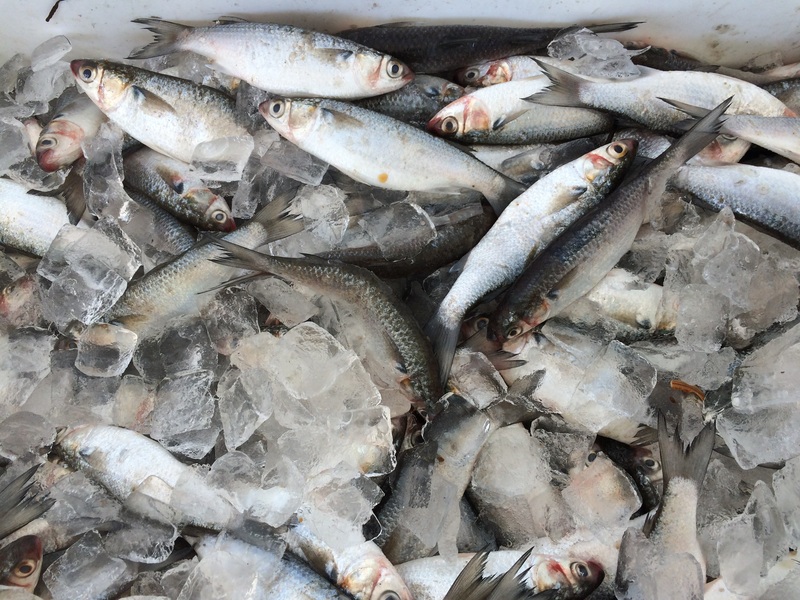 Pier anglers are also catching blues, speckled sea trout with an occasional grey trout mixed in, along with sea mullet, shad, blow toads, and keeper Striped Bass. 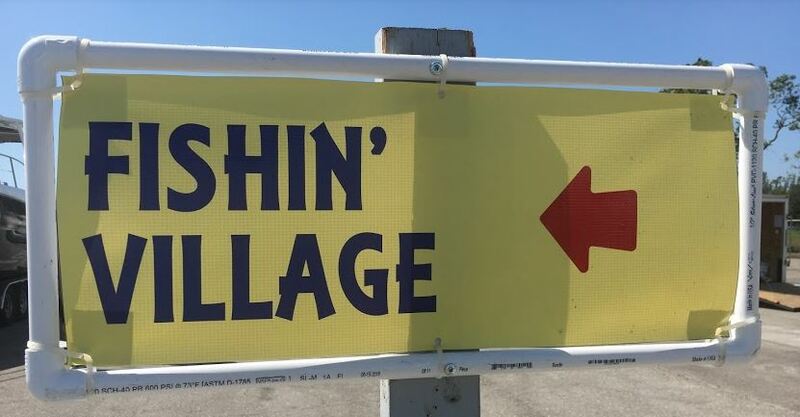 It seemed the fish bite can be found throughout the day. The old saying, “you just have to be there when they are hitting the baits”. Pier staff can always help with the proper type of gear and baits. The little bridge has been the hot spot on the northern beach in early May. Speckled sea trout, puppy drum, shad and huge runs of spot have been caught. This spot is an early morning bite. Most serious anglers have their catch and are usually home by sunrise. But visiting anglers frequent the bridge throughout the day with much success. Standard two hook bottom rigs with shrimp, blood worms, cut bait or artificial fish bites have all worked well. Trout and puppy drum are hitting a moving jig head with various color swim baits. May is a beautiful month to fish on the Outer Banks. And each day the weather continues to improve and fishing gets better. Remember – Always use fresh bait. Try not to use frozen or yesterday’s bait if possible. And don’t over-size your gear. Leave the big “rods” and heavy gear at home. Light medium or medium weight gear works best this time of year. But always first check with a local tackle shop or pier professional for the right size gear and bait. Spring is bringing change to the Outer Banks. The official start of spring arrived a month ago but you would never know it by the air and water temperatures. Just this past week though, conditions began to improve on the northern beaches so everyone is ready for mild weather. 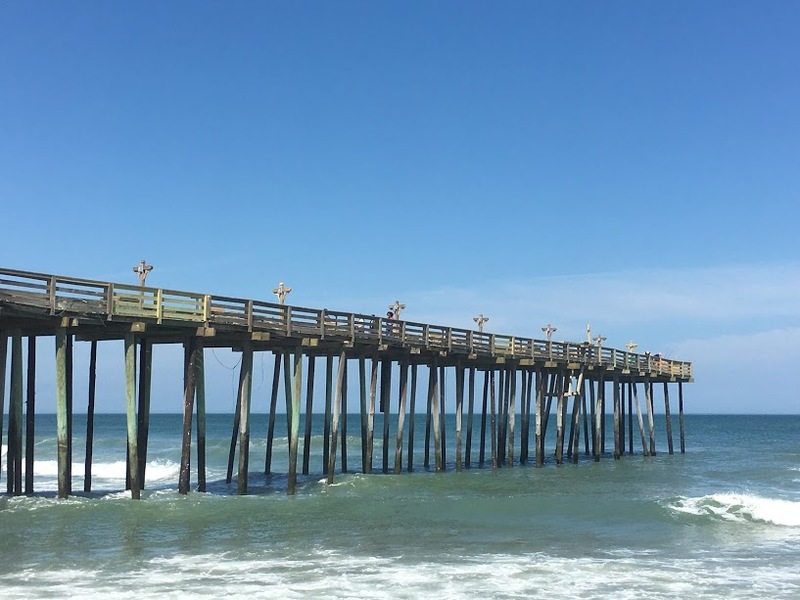 As word gets out that the warm temperatures are finally here and fish are biting, new and returning anglers will be flocking to the outer banks. Returning anglers may find several changes that they need to be aware. Many areas received beach nourishment over the past year. So those familiar sloughs and holes may have moved. Also, several piers sustained damage due to the numerous winter storms and are boasting new and bright structures. The surf and piers are ready for anglers but keep in mind there still may be some unfinished projects. But nothing should affect throwing a line in the water. The cold weather had a significant impact on one of our favorite’s species. 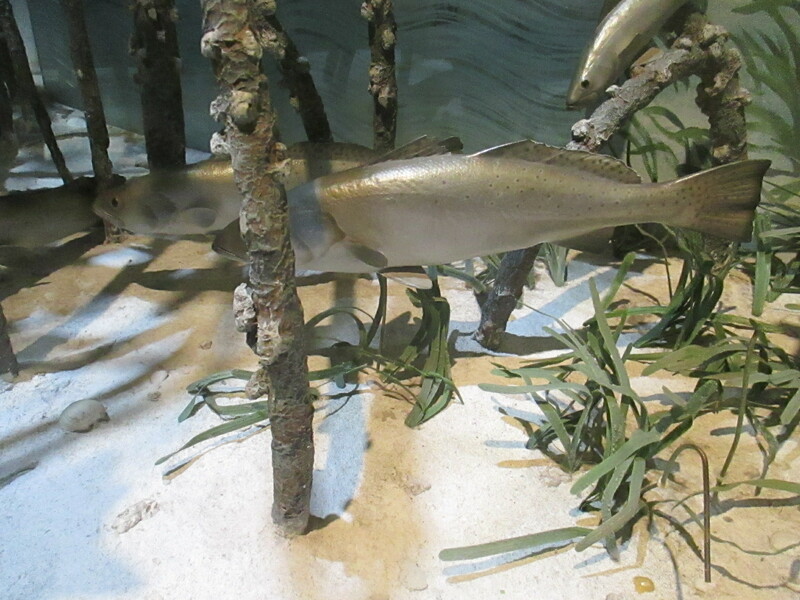 The Speckled Sea Trout had a major stun event and we possibly lost a significant number of them. North Carolina Department of Marine Fisheries (NCDMF) placed a moratorium on catching them through mid June. The biologists feel that they can re-bound with a little help from the angling community. Anglers will need a four-wheel drive permit to park and fish Currituck beaches. This is something new so anglers need to check with Currituck County before planning to fish at this beach. 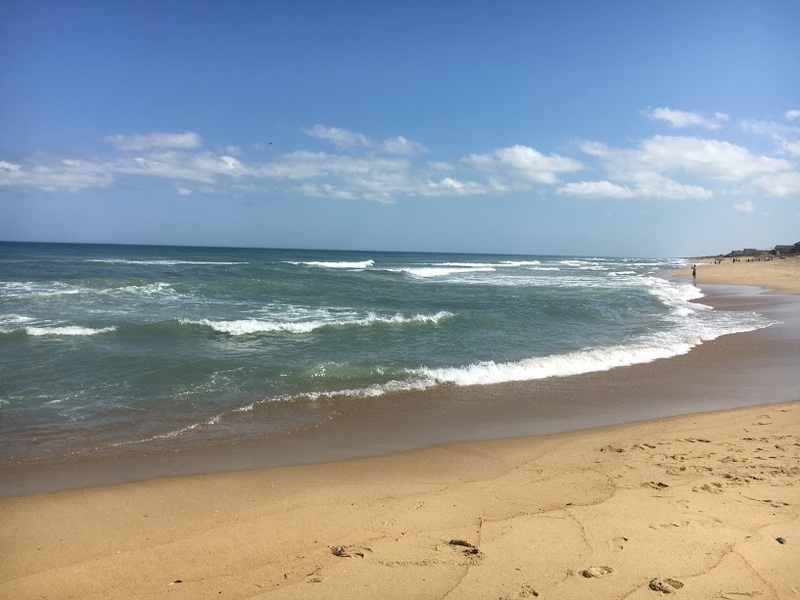 No major changes with the Cape Hatteras National Park. Permits are still required but additional accesses were created and access times adjusted. Anglers should check with the park service. There will be some disruption on the Oregon Inlet bridge catwalk. Anglers should have access through the summer but parking will be limited so arrived early for the best spots. Also, keep in mind there are several the other local bridges should still offer great fishing. We will be discussing more about these bridges in the near future. Most regulations on bag and creel limits have remained unchanged but occasionally there comes a need to modify a rule. All piers and tackle shops will have copies of the regulations. A good rule is to always keep a copy handy. Also, NCDMF has created a pocket size guide titled “Coastal Recreational Angler’s Guide”. This guide is free and contains valuable information on local fishing techniques, species pictures, and much more. Each angler should keep a copy in their tackle bag. Remember, weather is still unpredictable so if you plan to fish dress accordingly.